FYI: This post was sponsored by Rocky Mountaineer. 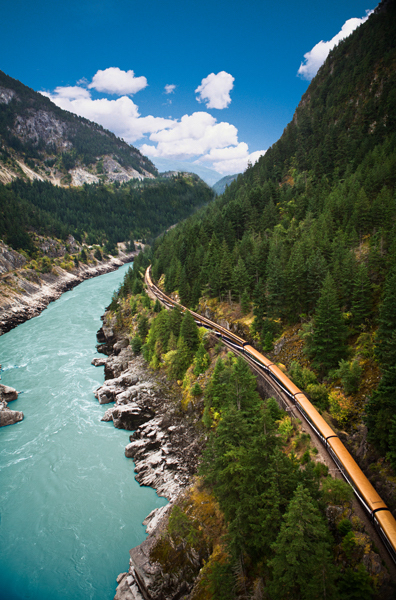 By connecting Vancouver, BC, and the Canadian Rockies with the cosmopolitan city of Seattle, WA, (okay, you’re very cosmopolitan, too, Vancouver), passengers will see plenty of secret gems along the Pacific Northwest during Rocky Mountaineer’s much-loved daylight rail adventure. And my first question to you is: Can a mountain be a hidden gem? In fact, can mountains be hidden at all? You may wonder how the highest peak in the Canadian Rockies, Mount Robson, rates as a hidden gem. After all, at 3,954 metres (12,972 feet), it’s not exactly something you can hide in your jewellery box. Well. Mount Robson is a hidden gem because it’s SO big and SO shy, it has created its own weather system and often surrounds itself with clouds. 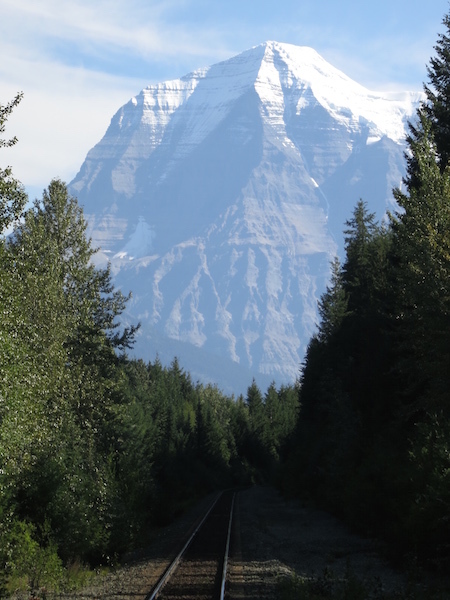 So if you’re lucky and Mount Robson decides to show its pretty face, you’ll have spectacular views as you pass by on the train (for a really long time, actually, like 16 km). 1) Mount Robson’s original name was Yuh-hai-has-kun, which means Mountain of the Spiralling Road. 2) Mount Robson is an aristocrat of mountains. I am not making this up. Mount Robson is officially classified as an Ultra Prominent Mountain, and is, in fact, the 119th most Prominent Mountain in the world. While technically prominence refers to the distance between a peak and the lowest contour line surrounding it, I happen to have it on good authority (my own), that prominence actually refers to social standing in the natural world. That’s right. Even the world of mountains is riddled with snobbery and social status, and that makes you, if you climb Mount Robson, a social climber. (Ah, ha ha.) It would also make you a superstar as only 10% of climbers who attempt to scale Mount Robson reach the summit. Pyramid Falls on the Coastal Passage Route – Just look at it! Bursting out of a forest of hemlock and cedar on the east side of the North Thompson River in British Columbia, Pyramid Falls are 91-metres (300 feet) high. If they’re so big, you ask, why are they a hidden gem? 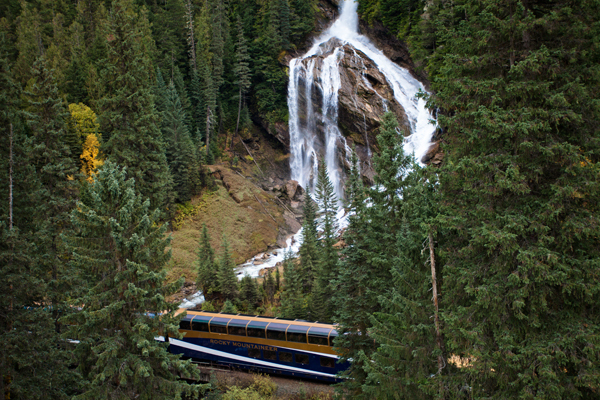 Because there are no trails to Pyramid Falls and the woods are dense, making it very difficult to access by foot, so the very best view is from the train because the falls go DIRECTLY UNDER THE TRAIN TRACKS. How mist-in-your-face refreshing is that? 1) Pyramid Falls are indirectly named after the great Pyramids of Giza, because as the water splashes down over two tiers of bedrock, it spreads out in a pyramid shape, and if the great Pyramids of Giza had never been built then the falls would have been named something boring like Ponzi Scheme Waterfall or Isosceles Triangle Falls – so thank you ancient Egypt, for making the wonders of Canadian nature sound a little more lyrical. 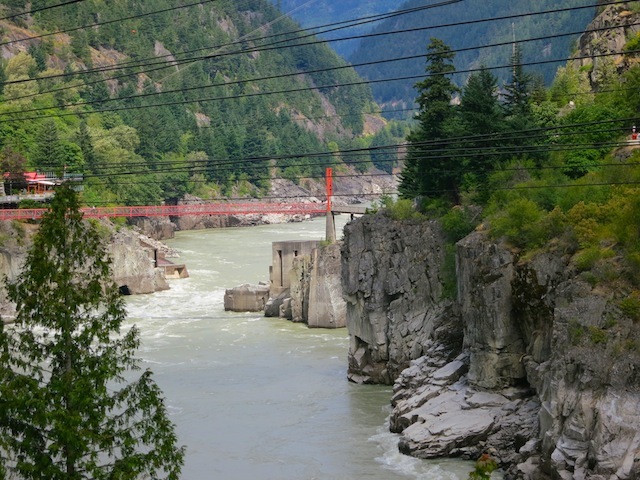 Hells’s Gate is a narrow passage on the Fraser River in British Columbia where 750 million litres of water push and shove their way through two sheer canyon walls like they’re commuters on a rush hour train. Why is such a dramatic passageway considered a hidden gem, you ask? Well, it’s a long way down, and very very narrow, so not that easy to see – though with an aerial tramway now going over it, I have to admit it’s not quite as hidden as it was before. 1) When explorer Simon Fraser saw this narrow waterway in 1808, he wrote that it is a “place where no human should venture, for surely these are the gates of Hell.” Which of course is how Hell’s Gate got its name. 2) The Fraser River was part of the Cariboo Gold Rush route, so you might say that an awful lot of miners had to go through Hell and back to get their gold. After crossing the border into the USA, the San Juan Islands come into view. Part of Washington State, the San Juan Islands are an archipelago of 170 islands named by the Spanish explorer, Francisco de Eliza, who charted them in 1791. How can an archipelago of 170 islands be a hidden gem, you ask? Good question! Because the bulk of every island is underwater, of course, in an iceberg type way, and, er, because if you close your eyes when you travel the Coastal Passage Route you won’t see them. I’m kidding! 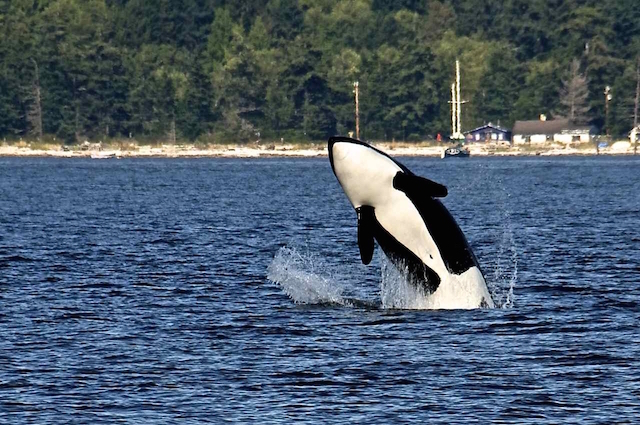 The hidden gems are the orca whales that make the San Juan Islands their home. The orcas are so beloved (and, in fact, almost as Ultra Prominent as Mount Robson itself) that they have their own island named after them, Orcas Island, one of the largest islands in the archipelago. So don’t blink when you pass by, and if fortune is smiling upon you, you’ll get a killer glimpse of an orca from the train. 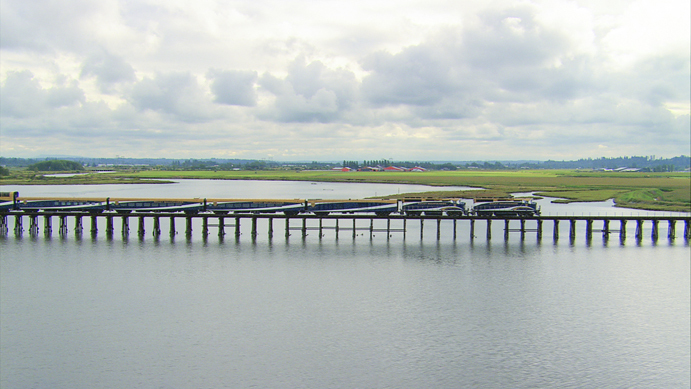 As passengers near Seattle at the end (or start) of the Coastal Passage Route, they’ll see a complex of locks at the west end of Salmon Bay. Part of the Lake Washington Ship Canal, the Hiram M. Chittenden Locks, also known as the Ballard Locks, provide a link for boats between the salt water of Puget Sound and the fresh water of the Ship Canal. 1) The locks were opened in 1917 and see more boat traffic than any other locks in the USA. They’re also are a top Seattle tourist attraction. So what makes them so hidden and gem-ish? Read on – it involves exciting salmon lore! To help the salmon transition between salt water and fresh water, a 21-step fish ladder is part of the locks system. The fish jump up the weirs (or, if they’re lazy, swim through tunnel-like openings), then enter Salmon Bay and swim back to the land of their birthplace. And then the females lay their eggs, the males fertilize them and then they all pretty much die. The hidden gem part is the Fish Ladder Viewing Room, where a window into one of the weirs offers a secret glimpse into the salmon’s uphill and ultimately tragic, yet life sustaining, journey, which is probably a metaphor for life, but let’s not think of that. No! 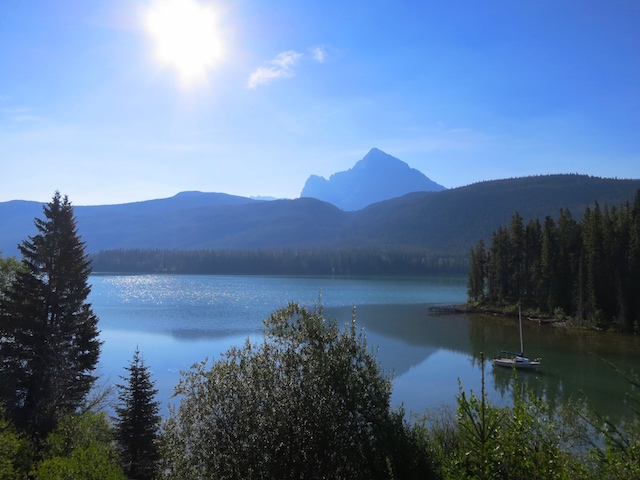 Let’s think of happier life metaphors such as a journey full of hidden gems bigger than a breadbox through the Pacific Northwest on the Coastal Passage Route with Rocky Mountaineer. And while we’re at it, let’s give the salmon Ultra Prominent Status, too. 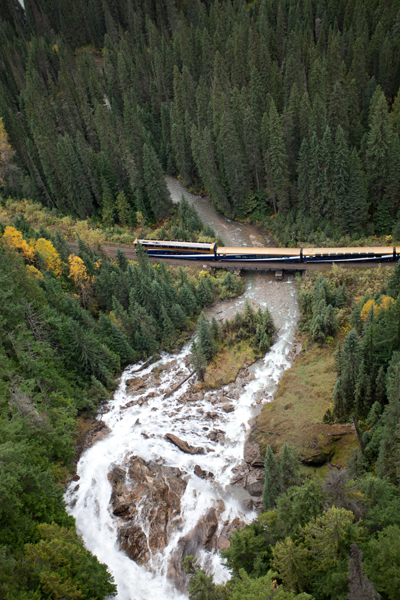 The Coastal Passage Route is Rocky Mountaineer’s newest route. 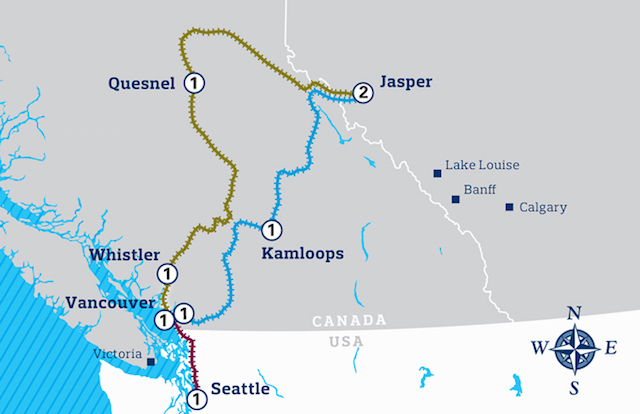 The Pacific Northwest loop takes in Vancouver, Whistler, Quesnel, Jasper, Kamloops and Seattle, or you can break it up or do specific sections. A wide world of train options is open to you. Still curious? 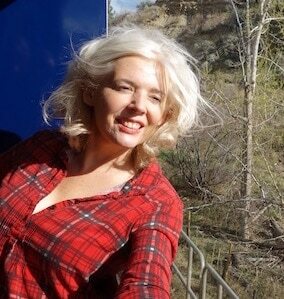 As Rocky Mountaineer’s current blog ambassador, I’ve written plenty about it (and love it so much I want to marry it). Planning a trip to Canada? 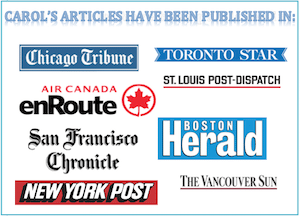 Visit my Top things to do in Canada article. Kayaking at Orcas Island must have been fantastic. Too bad you didn’t see any orcas. I was kayaking with belugas up in Churchill, BC, last summer and what a trip! What a fun adventure–so many awesome spots! 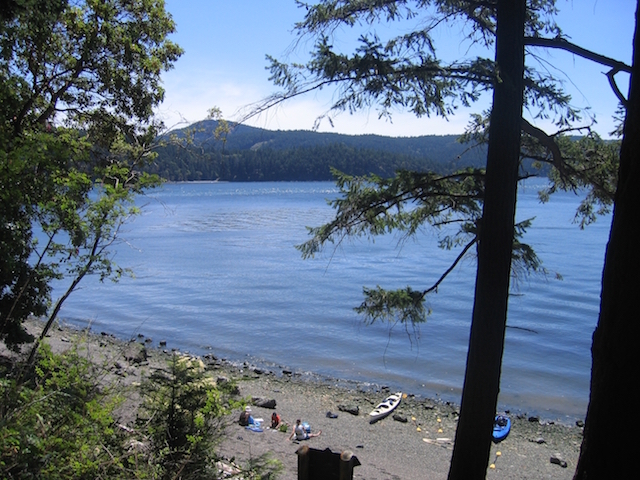 We just went kayaking near Orcas Island, but didn’t see any orcas :( It was still gorgeous, though! I would love to head to Jasper soon–looks so gorgeous there! I’m with you about the Coastal Passage Route, Michele – what a way to travel. And I had no idea that lavender grew there, Francesca, so now we both need to make the trip. Thanks, Kate – Yes, you should do this trip. The Mountain of the Spiralling Road awaits. I would love to go see that mountain. It looks amazing. It’s really no that uncommon for mountains to have their own weather systems. The whole train journey looks like fun. Uh wow, this looks amazing. I was not aware of all this, so thank you for sharing! 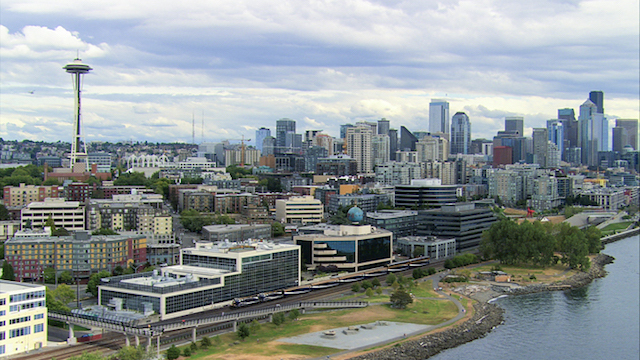 I love, love, love the PNW, its great that you can visit all of these gorgeous destinations by train. Thanks for the post, that brought back from wonderful memories of when I used to live in the Pacific Northwest! I haven’t been to the San Juan Islands for years and the last time was on a rather creaky ferry boat. The Coastal Passage Route sounds like a fab way to experience its beauty in luxury. Count me in! Wow! Didn’t know my country was so gorgeous! Mount Robson, Pyramid Falls, San Juan Islands…Wow wow wow! I’ve been to Jasper and know how special and stunning the Canadian Rockies are! The train ride on the Rocky Mountaineer looks like such a fabulous way to extend a Canada/Northwestern U.S. trip from Jasper! The Coastal Passage Route is on my short list of places to visit. I had heard about it, but you gave me much more information–and piqued my desire to dot this.